Our first course was chilled white grape gazpacho, which was paired with Glimmerglass, a limited edition brew with pear, apple and citrus aromas and a touch of spiciness. The second course was spring lamb meatballs, which we served with Witte, a traditional Belgian wheat ale, brewed with sweet orange peel and coriander. Our third course was slow-braised short rib, which we paired with Three Philosophers, a Belgian-style beer that contains 98 percent ale and 2 percent ale with cherries. Our fourth course, olive oil cake, was accompanied by Abbey Ale, a rich, fruity beer that’s brewed with licorice root, star anise, sweet orange peel, coriander and cumin. 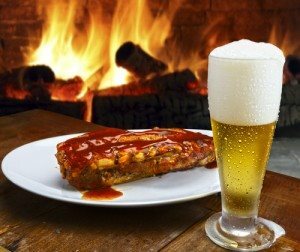 There are many ways to pair beer and food, so try it the next time you entertain.